We already know that there are plenty of areas within the five boroughs that are underserved by public transportation, but a new visualization provides an interesting perspective on how this lack of service is related to income. 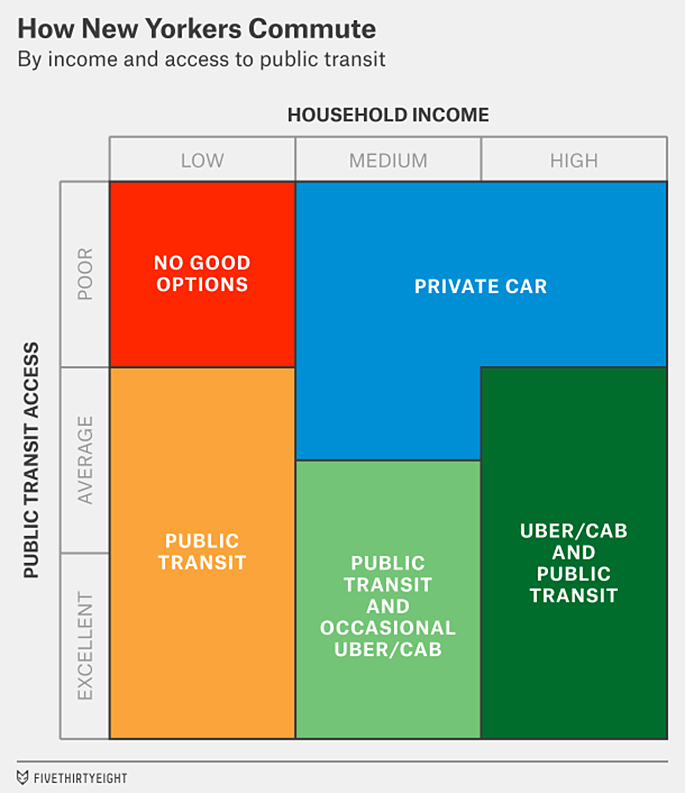 The simple infographic by FiveThirtyEight shows how New Yorkers commute based on income and access to public transportation, revealing five broad categories that range from those with no good options at all to those who have their choice of Uber or public transportation. The next group is also low-income, but they have access to at least one subway line. Group three is middle- to high-income, but has poor access to transit. Here, 72 percent of households, mostly in Staten Island and eastern Queens, have cars. The fourth and fifth groups are also middle- to high-income, but with good transit accessibility. Interestingly, New Yorkers who own cars typically don’t make more than $75,000 annually, so these groups rotate between public transportation and Ubers or taxis, with the higher income folks favoring the latter more. The infographic was actually created as part of a larger examination of Uber versus taxis, but makes a significant impact on its own, supporting the need for improved transit options like the East River Skyway, Triboro RX, which was conceptualized solely to connect the outer boroughs, or the return of streetcars to the Brooklyn-Queens waterfront and the Bronx.